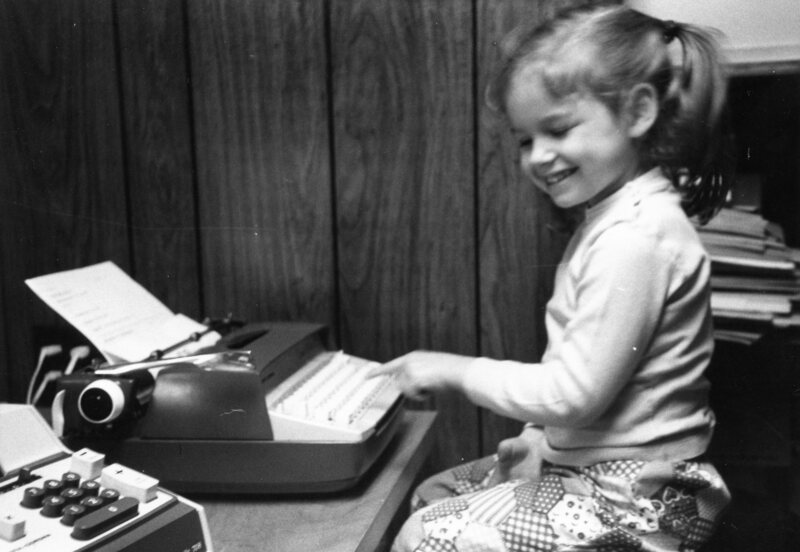 Five year old Gretchen typing next to an adding machine didn’t know she would become an engineer and fiction writer. If this is a post about phones, why not Jenny (867-5309)? Because this post is about changes in technology. When I was born, my parents only had a black and white TV with a dial. Granted, within a year or so we got a color TV, with a dial. Where do you think “don’t touch that dial” came from? Our phone was of the rotary variety and my childhood recorded on 8mm film. By the time I graduated from high school, we had VHS and Betamax VCRs, both with corded remotes, a camcorder, and I received a CD player for my new dorm room. Fast moving technology considering I saw my first CD in 6th grade. Fourteen years ago, my husband and I bought a 32-inch TV for our new home. We thought it was huge and it’s still the biggest one we own. None of our TVs are flat-screens. Maybe next year. As of yesterday, I took another leap into technology. My freebie flip-phone slipped out of my pocket on Saturday and didn’t resurface. It was in the plans for me to upgrade in a few months, so we replaced my phone with a new iPhone 5c (lime green, of course). I love receiving technology for gifts. I had a Handspring PDA then a Palm IIIc (with Wi-Fi) and now a Google Nexus tablet. 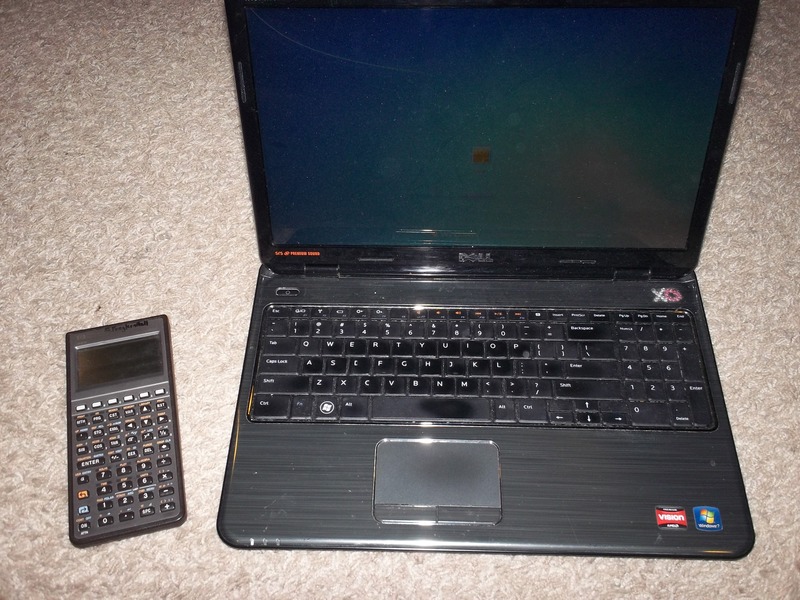 Most of my career, I’ve used a laptop. The funny thing is when it comes to telephones, I’m not a high-tech girl. Except for the dorms, I didn’t have a phone in my room until I graduated from college. I was one of the last people to migrate from an analog-digital phone. I rarely talk on the phone and just started texting a year ago. If smartphones were just phones, I’d probably never get one. While videos didn’t strike a fatal blow to radio music, cell phones are turning home phones into an endangered species. Are you high tech, low tech or somewhere in between? What my 5 year old would use to play writer and engineer. Or maybe she’ll go straight for the iPhone. This post isn’t about the state of my faith but the state of how I worship. I don’t like to sing. And in fact cannot. I’m tone-deaf and cannot keep a beat. So if you want to irritate me, call singing in a church service “worship”. I rarely worship through music. But I’m an evangelical and our services have been stripped of all liturgy. There’s some mistaken idea that if you do responsive reading, it’s meaningless and people just recite the words, and it doesn’t touch them. Guess what? I do that every single week. To music. It’s called singing. From the beginning of organized Christianity and even from the Jewish faith, God’s word has been repeated as responsive reading. With or without music. A portion of the Psalms called the Songs of Ascents were recited in correlation to Jewish holidays. Can you imagine a group of evangelicals reciting a Psalm in unison? A Capella? There are a good number who probably think that’s so ritualistic that it puts them on the church bus to hell. Because you know, it’s wrong to recite Bible verses in unison. For two millennia, there have been two churches the Eastern Orthodox Church and the Roman Catholic Church. They have rituals, they have creeds. Martin Luther came along. He split from the Catholic Church but retained liturgy in his new sect Lutheranism. Same for the Church of England when it broke from the Catholic Church. John Wesley never broke from the Church of England when he founded Methodism. They kept the liturgy as did the Presbyterian Church. I’m sure other denominations did too. I’m not really sure where the idea of not having liturgy came into practice. Whether it was specific evangelical denominations that gained influence or is a modern concept that evolved when guitars, drums, and tambourines showed up at church. More musicians. More performers. Less room for responsive reading. Sometimes it feels that way to this snarky girl. But I know that is so not true. Church musicians use their gifts to glorify God. And I enjoy listening to them. Anyway, I grew up in the Methodist church and loved having an order of worship. Songs we sang every week. “Gloria Patri” and “The Doxology” which for years I thought was the same song. They sound alike to my ears and end with “Father, Son, and Holy Ghost”. We said the Lord’s Prayer every week and always had responsive reading. My favorite was when we recited the Apostle’s Creed or the Nicene Creed. There’s nothing like reciting those words that distill our faith into a few dozen words. Because here’s the thing. I have a relationship with Christ but I also worship God the Father in a religion called Christianity. I like religion. It’s how I worship God. At fifteen, I joined the interdenominational church where my family are still members. I would be too if I didn’t live 1500 miles away. I remember when we first joined in the late 1980s we said The Lord’s Prayer. We recited creeds. We did responsive reading. We still had hymnals. At some point that went away replaced by 7-11 praise choruses and singing at tops 2 verses of a 4-verse hymn. My current church and pretty much every church I’ve attended in my various moves is like this. When did we become so afraid a few words repeated out loud or beautiful poems set to music would turn people off? I love contemporary Christian music. On the radio. Not as an act of worship. Although I admit sometimes I do truly enjoy it. See, I’m not a total old-before-her-time curmudgeon. What is a girl who only wants to recite the Apostle’s Creed (skipping over “descended into hell” more out of tradition than scriptural interpretation) just once in this millennium to do? What she does every week. Sets a good example for her non-musical son. Pray the music moves her. Mouth the words to the insipid praise choruses. Enjoy the one verse of the traditional hymn and wait patiently for the sermon. You know the song. That haunting and beautiful song by Suzanne Vega. The happy music with words about a very deep, dark issue–domestic abuse. I recently read the literary version, Swimming Through Clouds by Rajdeep Paulus. One of my favorite books of 2013, it is one that I enjoyed more after I read it, and one that I am likely to reread, at least in part. The story is about Talia, a girl forbidden to make friends or discuss her life at home. Nearly silent with a habit of biting her lips, she is the lowest of social outcasts at her new school. Lagan a popular athlete sees past this in his attraction to her. Allowing her silence, he communicates with her through sticky notes. I was privileged to hear Raj read an excerpt from one of my favorite scenes. Lagan draws a smile and a frown on sticky notes. All Talia has to do is cover one of them to tell him her feelings on single words. A story that is primarily Talia, Lagan, her brother Jesse, Father, and the Gardener could have been claustrophobic, but it reads like an intimate play. The small cast allows us to enter Talia’s world on a personal level. The gardener is really two characters, the actual gardener who is her employer, and The Gardener, a character in a book Lagan gives her. It’s a beautiful Easter egg that I won’t spoil by explaining. In sequence with Swimming through Clouds, I read Blue Skies Tomorrow the third and final book in Sarah Sundin’s Wings of Glory series about the Novak brothers, three very different B-17 pilots. The last book focused on the oldest brother, Ray, and his courtship with Helen, a single mother and war widow. She and her late husband were briefly introduced in the first book but not enough to know the secret she carried. With a small child, she’s at the mercy of her father-in-law, a wealthy and influential businessman the town admires but isn’t the same man when the doors are closed. Both of these stories focused on a terrible reality. Only in the last few years have Christian books even dared touch difficult topics as they’re evidently not popular among the core Christian book reading demographic (read: church ladies 30-60). But as readership has expanded to include all genres and reader types, the market is pushing boundaries. Swimming Through Clouds really doesn’t even address Christianity in a traditional sense. But that element is there in a way that is oh so satisfying. Blue Skies Tomorrow is a very traditional Christian book written for its primary demographic but with fantastic skill and attention to detail that shows great care in research. Many readers don’t like tough topics. Reading for many is a form of escape. The same goes for television and I had a great exchange with a friend on Facebook regarding a television show about this topic. She likes escape. I like challenge. There’s nothing like entering a world that is not my own and experiencing things I hope to never experience in reality. I used to shy away from suspense, danger, and gore but now I enjoy it. Crave it even. Although, I still write tame action, preferring psychological tension over an adrenaline rush. And I’m sorry if you have “Luka” in your head all day. Or maybe I’m not. You should be looking for someone who is hiding a dark secret. And pray for them. Maybe you will be a Lagan or a Ray to them.